Two decades after the Civil War, freedman Jim Hutchinson secured 10 acres of a former slave owner’s land for his son, Henry. Towering over a landscape clear-cut from years of sea island cotton harvest, today—even with a volt of vultures atop its Victorian roof and wisteria vines ripping the head jams from the windows—one can imagine Henry surveying the yard from his wraparound porch. What might he have been thinking? “The home is a testament and a monument to that period of time and to those folks,” says Girault. Jim had served in the Union army and helped arrest nine planters’ sons as Confederate spies. Following the war, he became a community leader and formed a co-op with other freedmen to raise money to buy land. But Jim barely lived to enjoy the fruits of his freedom. He was killed by a white man in 1882. 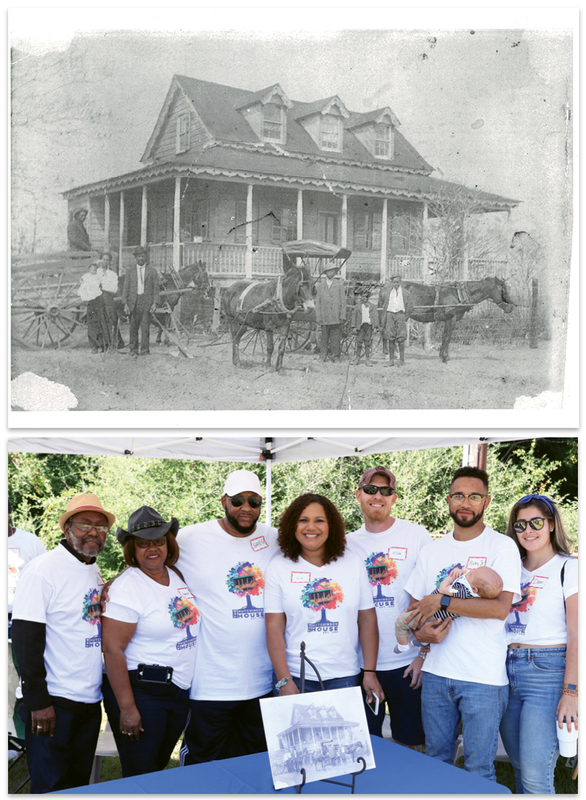 (Top) Henry Hutchinson’s family at home circa 1900; (Bottom) Hutchinson family descendants, who are helping to raise funds for the project, gathered on the property last fall. Henry built the house for his bride, Rosa Swinton, three years later and operated one of the island’s first black-owned cotton gins nearby. The place was passed from generation to generation until the last Hutchinson moved out around 1980. Now it’s EOLT’s mission to preserve the site and tell its story. Using a grant from the State Historic Preservation Office, EOLT is now in the process of contracting for a conditions assessment and preservation plan. The nonprofit will spend the next three months working with Charleston-based architects Simons Young + Associates, structural engineer John Moore of 4SE, and contractors to determine how to best restore the home to its circa-1885 specifications—researched with help from American College of the Building Arts students. This kind of work is novel for a land trust, yet EOLT will also preserve the surrounding property and aims to purchase a neighboring 10 acres to protect it from development. They haven’t yet settled on the best way to open the monumental site to the public, but “the family wanted this to be a community space,” says Girault. And soon, he promises, it will be.